Our journey has begun! Can that be possible? On Sunday, we woke up early to get the majority of our hiking in before noon. International Friendship Park, the western terminus of our border hike that abuts the Pacific Ocean, is only open to the public for a limited 4 hours a day, Saturday and Sunday. We had run across an organization called the Friends of Friendship Park in our research, and wanted to attend a mass they were hosting at 1pm. It seemed like a good way to start the hike. But we had to hustle, the ocean was about 15 miles from our hotel and if we missed our shot we’d have to skip this important marker or wait an entire week. As we walked, we were surprised to note how quickly our surroundings changed. We started in Otay Mesa, an area right on the border that feels more like a suburb of Mexico. Lots of people walking around, fast food restaurants, messy traffic, and a default language of Spanish. Everyone here is bilingual. We stood in a very busy line waiting for food at one point and each of the frazzled workers behind the counter flawlessly managed to switch between English and Spanish with only a second to make the decision. It seems to be a common (and impressive) skill out here. After walking only a miles or so, our surroundings switched to large office buildings and industrial plazas. It looked like it had been built yesterday but was strangely almost empty. Huge parking lots with perfectly manicured green lawns, well-tended flower pots, a beautifully paved six lane road running through it and almost no cars. It made for easy walking but it definitely felt eerie. Eventually we hit the first border wall, a giant and ugly mass of chain-link fence and barbed wire. For much of the San Diego/Tijuana Border there are two fences with a no-man’s land in between reserved for the exclusive use of border patrol. The entire structure emits a “don’t even look this way” vibe. You feel like you’re doing something wrong just by being nearby. About ¼ mile from the fence, we made a sharp turn west while a Border Patrol car slowly inched along following our progress. Again, the area was deserted but we were able to follow footpaths through the overgrown field that paralleled the fence for about a mile. We then hit an enormous parking lot at the Cross Border Xpress, where possibly people park for the day and travel to Mexico on foot? After moving through such empty streets, it felt good to see ordinary people walking around. It was short-lived, though, and less than ½ mile later we were walking past parking lots for semi-trucks on empty roads. Neither of us have ever really walked through a city like this before, moving on the outskirts, and it’s kinda shocking to realize how poorly we often utilize our space. The truck lots were still pretty well tended, an aesthetic that continued to surprise us throughout the day. This changed as we neared the Pacific Gateway Park, an area owned by the City of San Diego and opened up to the use of recreational motor vehicles, that honestly was a bit of a dump. There were several trails through the “park” that took us up and over the first hills of the day. These were STEEP and not designed to be taken on foot, but they did offer some expansive views of the fence on our left and the sprawling border crossing that lay ahead. We were so close to Mexico we could hear conversations from across the border. It’s crazy to think of living so close to someone, close enough to hear their conversations, and be separated by such an enormous gulf of nationality, economics, freedom of movement, and language (although unlikely in bilingual San Diego!) Such a different experience than anything we’re accustomed to. After scrambling down some treacherous scree, narrowly avoiding a wasp nest but not the plethora of thorny Russian Thistle, we made it to the San Ysidro Port of Entry. A Border Patrol officer greeted us, Lucas. He was calm and barely inquisitive, which immediately struck us as bizarre considering we had emerged from a bush. It was the first time we would vocalize our mission to a resident of the area..scary. Bated breath as we waited for his response to “we’re hiking the border of Mexico”, slight confusion flickered across his face before he breezed past our statement. San Ysidro, talk about an abrupt switch. We just exited the impassable hills and entered a vibrant and thriving plaza/mall with hundreds of milling pedestrians. The bulk of it appeared to be an enormous outlet mall, and by enormous we mean that it took at least 30 minutes to walk through. Tons of families, little kids running around, packs of teenagers, tourists, everyone and everything. We took a small break to rest our feet, at this point we were over 7 miles into the hike and making great time. The next step was crossing the San Ysidro River, which Googlemaps shows to be a wide torrent of blue, but in actuality is mostly a stagnant trickle. This would not be the last extremely depleted river we would cross. As we continued over the bridge, we looked over the side to see enormous cane, over 10 feet high in places, and an impenetrable mass of green. An entirely different world from the steep desert Jeep trails of only 3 miles ago. As we walked through the marsh, we could see the next set of hills and behind them a faint smudge of ocean. The breeze picked up and provided some welcome relief from the tepid humidity of the day. Friendship Park felt in reach. The route wound us through the hills on hiking/biking/horse trails that someone official had clearly set up in an attempt to provide wilderness access. As interesting as our surroundings had been up to this point, it was a relief to be back on trail. It’s crazy that walking, especially with a backpack, is often seen as an aberration in high-density areas. Why does walking in a city carry such stigma, while hiking in the “wilderness” is understood and respected? At long last, we reached the park entrance and joined other hikers (the first of the day!) in migrating towards the ocean and western terminus. Our surrounding became sandier and scrubbier, and we got our first ocean whiff. Right against the ocean was a tall bluff, with a perfect ring of trees poised at the edge. Obviously this was the park, only human hands could have created such a pristine image. As we neared the entrance, we could see a handful of people milling around, taking selfies by the ocean and resting at the picnic tables under the trees. After the hustle and bustle of the day, it was a fairly sanitized representation of the border. Especially when you looked over to the Mexican side and saw at least 30 people jumping into the surf and enjoying the water. The entrance to the park was a small opening in a chain link fence, with a border patrol guard standing watch. The sign claimed that occupancy was limited to 25 people at a time, and we thought we’d be stopped as we tried to enter, given the crowd already inside. But no one stopped us and we slid on in. And then the magic happened. 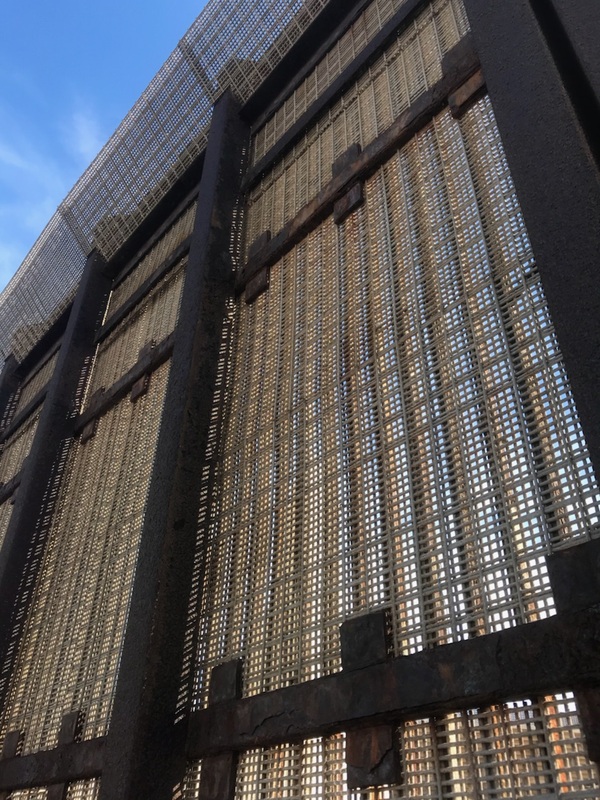 As we stood by the border wall, a intricate criss-cross pattern of thick wire that allowed openings no bigger than a fingertip, people just started talking to us. Tenny got involved in a conversation with a gentleman on the other side of the border, with no prompting on either part. His name was Jesus and through the matrix of metal you could catch an occasional glimpse of his squinted eyes, kind eyes that seemed to grip both sad and happiness. His wife’s name was Norma and he had 5 kids. His family was divided by the same wall we spoke so casually through. It is disorienting and frustrating to speak through a such a tiny hole, you miss the subtle expressions and gestures which bring the conversation to life. At the same time a gregarious and charismatic man with a big smile introduced himself to Claire and gave her some info on an organization called Border Angels. We’d actually heard about the organization before and had desperately hoped to meet up with them, and, in the way of trails and the magical workings of the world, it happened. Border Angels is a humanitarian organization operating out of San Diego and Tijuana with an extensive network of volunteers and allies along the border. They offer a number of services, including shelter for recently deported immigrants, consultation services, educational and service-oriented programming, and perhaps most famously (and controversially) water drops in areas with high-risk migrant crossings. Enrique Morones, the founder of Border Angels and the gentleman talking with Claire at the park, seemed to have a limitless energy and passion for humane immigration reform and activism in general. We cannot imagine a better person to find at this exact time as we began our trip. He immediately responded to our project and began brainstorming ways to help and encourage us, at a dizzying speed. 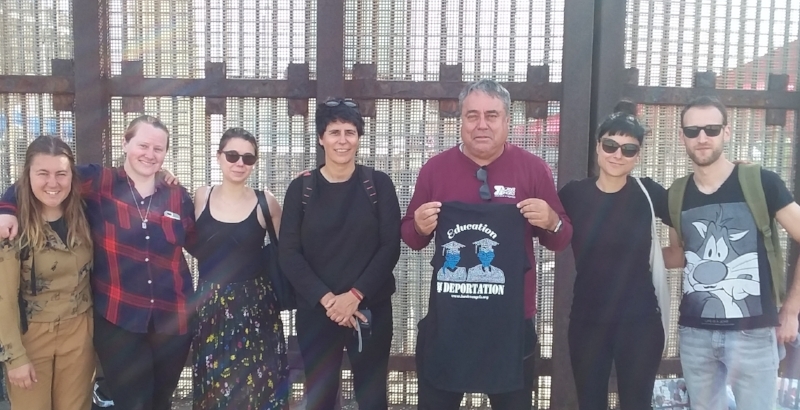 He introduced us to Hugo Castro, the Border Angel coordinator on the Tijuana side, whose face, despite being less than 2 feet away, we could barely make out through the mesh fence. Both men reached out to us and asked questions about the project, offering their enthusiasm. Thank you Enrique and Hugo. It was inspiring and humbling to meet you, to hear your stories, and to receive your encouragement. As we spoke to Enrique and Hugo, Friends of Friendship Park, the group we had originally planned on organizing the day around, began their worship. They had a presence on both sides of the wall, and the pastor moved between Spanish and English, with his colleague on the other side translating as well. They also had a guitar player and singer. It was great event, more casual than we would have expected, welcoming any and all regardless of nationality or denomination. Near the end of the service, the pastor asked if we would receive communion, which we were grateful to do. As we ate the bread dipped in wine, he asked us to say a few words to the Americans and Mexicans on both sides of the fence and then gave us his blessing, which was echoed by the congregation. Thank you Pastor. And thank you to all who participated. Your encouragement and good thoughts sustain us. We truly could not do this without you, and the love you gave so freely will keep us going. It felt like we’d only been there minutes, but well over an hour after we arrived the park closed. With almost no signal that we saw, everyone packed up and left, precisely at 2pm. Presumably many of them are well-accustomed to the routine. Enrique offered to walk with us back to the car. We went down to the beach so we could touch the ocean and truly claim to have walked “end to end”. We found a large number of sand dollars as we walked, and picked them up at Enrique’s urging. Maybe we can carry them all the way to the Gulf of Mexico? It’s a nice idea. When we made it back to the parking lot, Enrique kindly offered to drop us off back at the outlet mall we’d been so amazed to see hours before. At dusk, it was just as busy as it had been in the morning, with hundreds of people enjoying the discounted clothing, amiable atmosphere and proximity to the border. As he dropped us off, Enrique pointed to a kids’ play area, full of screaming, laughing children, only a few feet away from the border fence. Just another example of the many juxtapositions that have surprised us today.